We provide lawsuit loans on all types of cases. Call today for your lawsuit cash advance. Please fill out the form and we will reach out to you and start the process. You only repay your advance if you win your case. We work with your law firm to see if we can approve your case. Lawsuit Loans can help make ends meet for plaintiffs who are unable to work or behind on their bills after a car accident or some other type of injury. 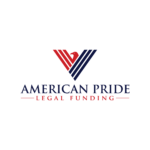 American Pride Legal funding is a lawsuit funding company that services plaintiffs seeking an advance on their pending personal injury claim. We have developed attorney relationships across the country and help plaintiffs in need of financial assistance during a difficult time. Millions of people are involved in some type of personal injury case every year. Personal injury claims can range from car accidents, medical malpractice, and premise liability cases. Any injury whether it is a small car accident or an auto accident requiring surgery, is considered a personal injury claim. Insurance companies have tremendous resources to delay payment and ultimately pay as little as possible. By receiving an advance on your expected settlement, you can give your attorney the time and flexibility to pursue your case. A cash advance against your lawsuit can take care of pressing expenses and let your attorney maximize its value while battling with the insurance adjuster. How lawsuit loans work is a very simple process. However, their are many components involved in how lawsuit loans work. Applying for a lawsuit loan is rather simple, give us a call or apply online and we’ll call you and get some basic information. Once we have your contact information, we will reach out to your law firm to get some standard case information. From there our attorneys can estimate the value of your case. As a rule of thumb, car accident cash advances range from $500 to $100,000. The higher value of your case, the higher potential lawsuit cash advance you can be approved for. How fast you receive your car accident loan or car accident cash advance depends on how fast your law firm or attorney can pass along your basic case documents. From there, we can quickly review and issue an approval and funds with 24-48 hours. Every case is unique and every person has different needs. We value our client relationships and will do everything we can to help you get the financial assistance you need during a difficult time. How Can The Lawsuit Loan Process Be Sped Up? The answer is that once we have your case information, the lawsuit loan process takes about 24 hours to complete. However, it can take some time to get the information we need to review your case from your attorney. So, it largely depends on how fast your attorney can send us the information we need. Often, we need additional information and must go over a few details with your attorney. We work as fast as we can to get the necessary information as we know that time is of the essence. We specialize in lawsuit loans for car accidents and related personal injury claims. In addition, we provide advances for truck accident cases, medical malpractice claims, premise liability cases, slip and fall cases, and wrongful death cases. How do you access the value of my case and my car accident loan? The value of any case is not cut and dry. There are many variables to consider and each case has its own unique characteristics. We look at the liability, the severity of the injury and the insurance and coverage as well as any outstanding medical liens and bills. Those are just a few of the variables that can determine a case value. Legal funding and lawsuit loans can be expensive, we have a handful of rates structures and once we have the details of your case, we can give you a better idea of what we can do for you. The most common kind of lawsuit loans are car accident loans. Here are some specific approval criteria for car accident loans. First, you cannot be at fault in the car accident. Second, your case must be handled by an attorney. You can’t receive a lawsuit loan without representation since having an attorney is integral to the approval process. Next, the extent of your injuries will determine a large part of the value of your case. Finally, the ability of the defendant to pay and the actual amount of coverage of the party that injured you. We can only fund cases that are against an insurance company, a government entity, or a large company with known substantial assets (Fed-Ex, Walmart etc.). Cases involving a commercial vehicle are judged the same way as car accidents involving individuals. However, commercial vehicles are required to carry more coverage or insurance. Also, the damages involving a large vehicle can be much greater. Accidents involving commercial vehicles are more complicated and usually involve an attorney with an expertise in trucking accidents. Common types of commercial vehicle accidents include Uber Drivers, 18 wheelers, delivery trucks, and landscaping trucks. The second most frequent claim we see is a premise liability lawsuit. These types of cases occur when an individual is injured on private or commercial property. For instance, when there is a slip and fall incident, it is possible the owner of the property is liable. For there to be liability, negligence by the property owner must be shown. A premise liability case is evaluated by looking at the defendant’s liability, the injuries sustained and the ability of the property owner’s insurance company to cover your medical expenses and injury claim. When you give American Pride Funding a call, you’ll have a one on one experience with your account executive who will walk you through the process. You won’t be contacting a call center. We’ll take an interest in your case and help the best way we can. There is no upfront fee for applying. To start the process just give us a call and we’ll simplify how lawsuit loans work for you.